The correction to “use your core,” “engage your core/abdominals” or “lengthen your abdominals” is a correction that many dancers receive. While implications appear to be clear, what the teacher usually wants is the correct alignment of the pelvis and the consequentially, the alignment of the ribcage. This deviation is apparent in many movements such as balancés, pliés, tendus, dégagés, and battements. A grand plié in first position will be used in order to dissect the common correction to “use your core” by examining the mechanics behind a common postural deviation: pelvic tilt. A grand plie in first position is often one of the first movements that is taught to a dancer as they begin their training, and is frequently practiced in an effort to warm up the body at the start of class. This movement is a lowering of the hips within the frontal plane. It begins with the flexion of the knees, the hip joints and ankle joints as the body lowers. The heels are placed together with the toes extending outwards in the dancer’s natural turn out. The descent continues until the knees are almost completely bent. To come up from a grand plié, the knees slowly straighten, but the heels touch the floor before the knees straighten and the body is in a standing position. The hips and feet are turned out in first position as a result of external rotation of the hips. When the knees bend, the turn out of the hip guides the knees to track over the second metatarsal in the feet, moving the legs in the frontal plane as well as the turn out allows. 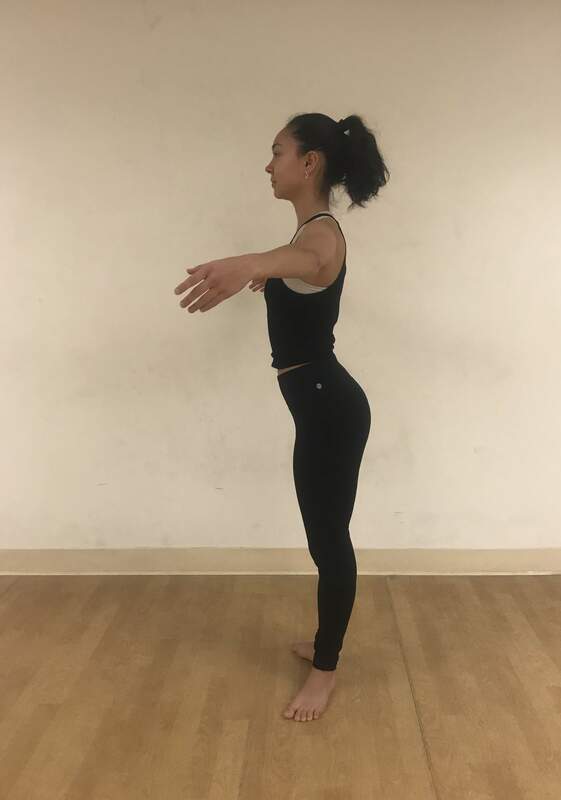 While a dancer may consider this movement simple, many deviations can occur: ankle pronation or supination, anterior or posterior pelvic tilt, spinal curves, incorrect tracking of the knee over the foot, bad alignment of the scapulae, and even forward cervical curvature. In this article in particular, the focus will be on pelvic tilt as a result of a disengaged core. To further understand the mechanics of a first position grand plie, it is important to consider what joints are used. Firstly, the synovial ball-and-socket joint of the hip offers the external rotation and abduction needed for first position turnout. The hip joint can move in all planes; however, the abduction needed occurs in the frontal plane to properly control the direction of the femur bone. The other two joints involved, the knee and the ankle, are hinge joints. Both joints are involved in flexion, which occurs in the sagittal plane. Flexion of the knee is what initiates the plié. However, while the other two joints activate muscles to support and control the downward and upward motion, the ankle joint flexes as a result of bending the knees to such a low position and muscles do not actively flex the foot or extend the foot to prop up onto the metatarsals. Passive flexion of the ankles at the depth of a grand plié. 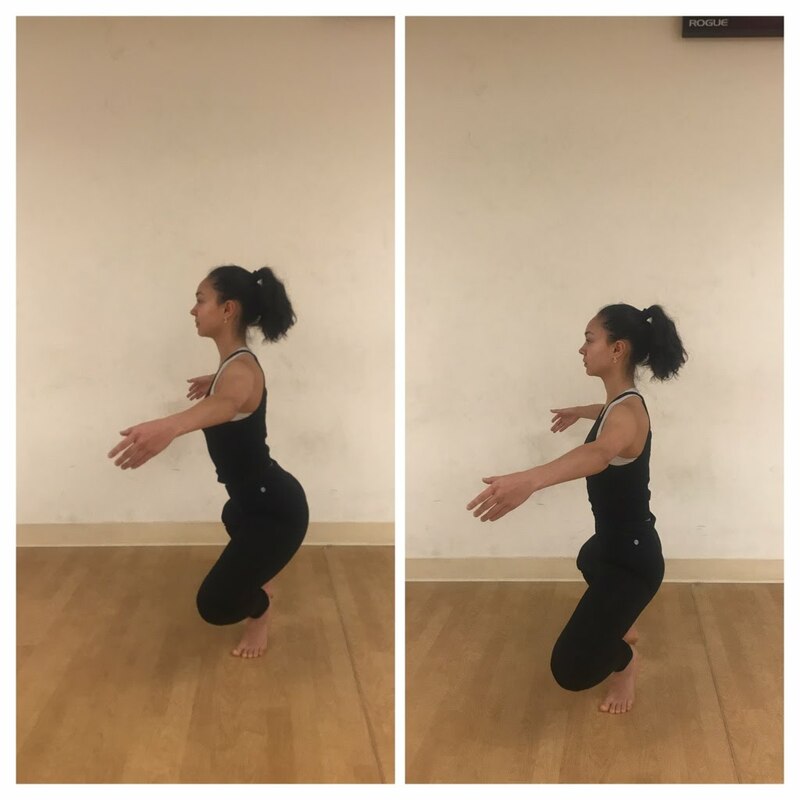 During this movement, the heels should come off the floor naturally, as the knees continue to bend, as opposed to rising to relevé before knee flexion forces the raising of the heels. In looking at which bones move in the grand plié, it is important to look towards those that support the movement. The femur, a long bone, which is resting in the acetabulum of the hip bone. The patella, a sesamoid bone, covers the anterior side of the knee joint. The tibia and fibula are both long bones, the structure of which, when the femur is externally rotated in the hip joint, allows for the knees to track over the line of the second toe. The calcaneus, tarsals, and metatarsals are all short bones in the feet. Proper alignment of the foot, without pronation or supination, relies on the position of these bones staying neutral. The metatarsals must distribute the weight evenly between each toe when the plie takes the body onto the balls of the feet. This shows that in a first position grand plie, joints and bones are important in facilitating movement because without them, muscles cannot do their job. After understanding the bones and joints, we can begin to consider the main musculature that is involved in a first position grand plie. The muscles are the most important component that facilitate both the grand plié and stabilize the pelvis. The abductors, gluteus maximus and psoas help support the slow lowering of the body. The piriformis, connected to the sacrum and ischium, in addition to five other deep lateral rotators help with maintaining the turnout of the hip. The hamstrings assist in holding the hip and knee in position. The gastrocnemius, soleus, and flexor digitorum longus help support the calf in connection to the knee and ankle joints in the grand plié. During a grand plié, these muscles perform both concentric and eccentric actions, since they both flex and extend the hips, knees, and ankles. In the feet, the lateral abductor digiti minimi and the medial adductor hallucis support the lateral arch and big toe. The bones and joints that are involved specifically in pelvic deviations are mainly the spine, pelvis, and femurs. The spine is made up of irregularly shaped vertebrae separated by intervertebral discs. The connections between vertebrae are restricted and cannot be isolated like synovial joints. The spine can curve and twist as a whole, but individual vertebrae cannot move freely. In an anterior pelvic tilt, the lumbar spine has increased lordosis, or concave curvature. In this example, the dancer stands in first position, with an anterior pelvic tilt. Observe lordosis of the lumbar spine, and hip flexion at rest. From this starting position, the kinetic chain is disrupted, lateral rotation of the hips is impaired, and therefore turnout is more likely to originate in the knees and ankles. The second major bone structure involved in this deviation is the pelvis. The pelvis is an irregularly shaped bone made of three bones (the ilium, ischium, and pubis) fused together. It has a large space in the middle to hold digestive and reproductive organs and is connected by posterior ligaments to the sacrum, which serves as the base of the spine. The movement of the pelvis is connected to the movement of the spine; when the pelvis twists in the horizontal plane, the spine twists, and when the pelvis tilts in the sagittal or frontal plane the spine curves as well. In this deviation, the superior end of the pelvis tilts anteriorly, pulling the lumbar spine into lordosis. Lastly, the position of the femurs is affected by the tilt of the pelvis, since they are connected via the hip joint. This can potentially impact range of motion of the hip in all planes of motion. Using épaulement adds to the desired aesthetic affect of this movement. Kinetic chain balance contributes to the mobility of the upper body, making this possible. Dance teachers often remind the student to align the ribcage directly over the pelvis as a way to contract the abdominal and oblique abdominal muscles and lower back muscles. In order to support both the lowering and raising of the body, the core must be strong in order to maintain correct vertical alignment and to support the weight of the body; the gluteus muscles, quadriceps, and hamstrings must be strong so that the body does not “sit” at the deepest point of the plié and is still actively lifted. While the joints should stay stacked in vertical alignment, the added ballet quality of épaulement allows for the cervical spine to have a little fluidity, adding elegance to the movement by softening the chest and moving the head. To better understand the implications of anterior pelvic tilt, it is important to understand its connection to the kinetic chain. The kinetic chain claims that power is transferred from joint to joint and that movement efficiency depends on a balance between mobility and stability up and down the chain. This can be seen in the take-off and landing from a jump. Both of these movements require the use of a plié to ensure the optimal amount of power. The optimal power comes from the length-tension relationship, which claims that the initial length of the muscle influences its force production. With this being said, beginning a jump from a grand plié would not yield optimal results- a more intermediate position would be best. By exhibiting correct alignment and length-tension relationship, power would be at its peak. The kinetic chain also involvesalternation between points of mobility and stability, which are also key to the effectiveness of the movement. In an anterior pelvic tilt, the lumbar spine exhibits too much mobility, which interrupts the balance of the kinetic chain. The correction of a pelvic tilt requires muscle activation around the lumbar spine to help increase its stability. This does not inhibit the mobility of the hips, and the femurs can still move freely within the hip joints. The correction to “use the core” really intends to stabilize the lumbar spine. Therefore, the kinetic chain can be made even more effective by this correction. Injuries can occur when an area that is supposed to be mobile is too stiff or stabilized, and vice-versa. This correction helps maintain the balance between stability and mobility. In this side-by-side view at the depth of a grand plié, the image on the left, shows how anterior pelvic tile results in hip flexion, which impedes verticality in a grand plié. In the image on the right, observe Lucy using correct pelvic alignment. This allows for unimpeded mobility of the hips. Addressing this correction would challenge the body to relearn how to perform a first position grand plie, because it would potentially be working against years of compensation created by performing a movement incorrectly. To work on this correction, exercises can be practiced which improve muscular endurance, especially that of the abdominals and hips (gluteus muscles). To permanently embody this correction, the dancer would need to increase muscular endurance enough to allow them to constantly contract those stabilizing muscles without fatigue through the entire ballet class. Someone who struggles with a pelvic tilt may feel that their body is naturally inclined to release the abdominal and hip muscles and have difficulty in maintaining these muscular contractions through the duration of the class period. It is a difficult correction to address instantly and permanently. Some exercises that may aid in this correction are: bridges and a kneeling leg lift. Kelli Rogers is originally from the Chicago suburbs. She is a Senior at Loyola University Chicago pursuing a major in Molecular Biology and a minor in Dance. She hopes to keep her love for dance alive as she strives to go to medical school to become a pediatrician. Lucy Jaffar is a sophomore studying Dance and Psychology at Loyola University of Chicago. Originally from San Francisco, California, she attended a public arts high school with a dance focus and studied at San Francisco Ballet for several years. She is interested in working in dance administration and teaching. Lauren Bunke is from Grayslake, Illinois. She is a junior at Loyola University Chicago pursuing a degree in Biology (with a Molecular Emphasis) and a minor in Dance. She is currently devoting much of her time to assisting with research in neuroscience at Rush University, and she plans to pursue a graduate degree and a career in biological research. Darcelle Murray is from Chicago, IL and is right now at Loyola University Chicago with a major in Business and a minor in Dance. Her favorite type of dance is ballet and pointe. As a person with disabilities, her goal one day is open up her own dance studio and be a dance teacher for people with disabilities.